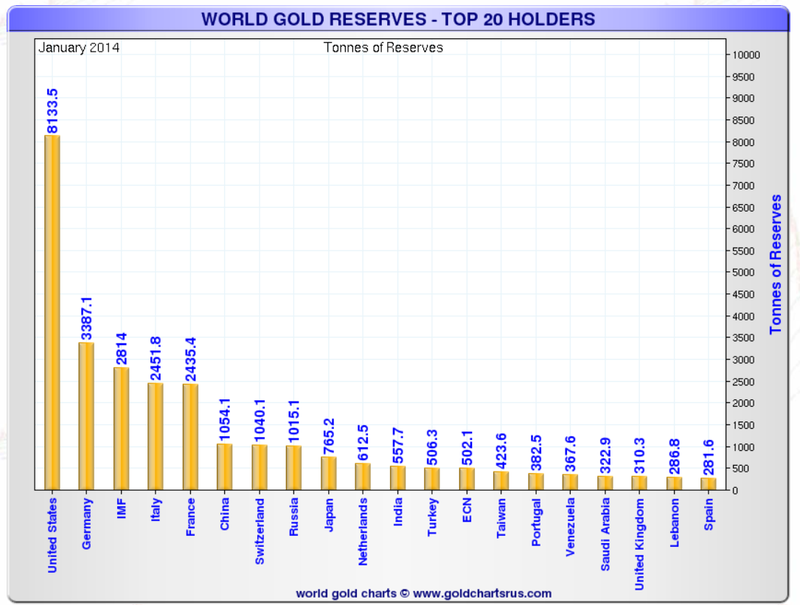 My friend Nick at Sharelynx Gold has an interesting chart on world gold reserves that I would like to share. For those who think the US is going to enter hyperinflation with the US dollar becoming completely worthless, I reply that it will not and cannot happen because the US has the world’s largest gold reserves. I am strongly in favor of an audit, but spare me the hype about US gold being tungsten-filled bars or the gold has all been removed, etc. Strong price inflation is possible, albeit highly unlikely at present. Given the possibility of a gold-backed dollar, hyperinflation, with the US dollar becoming worthless as happened in Weimar or Zimbabwe, isn’t remotely possible. Of course there are numerous other reasons to discount hyperinflation hype. For further hyperinflation discussion, please see Hyperinflation Nonsense in Multiple Places.